2LegoOrNot2Lego (Ingmar Spijkhoven) just built another gooseneck lowboy trailer. Ingmar has made several US style trucks and some heavy machines. Then obviously some kind of lowboy is required for the first to carry the second ones. 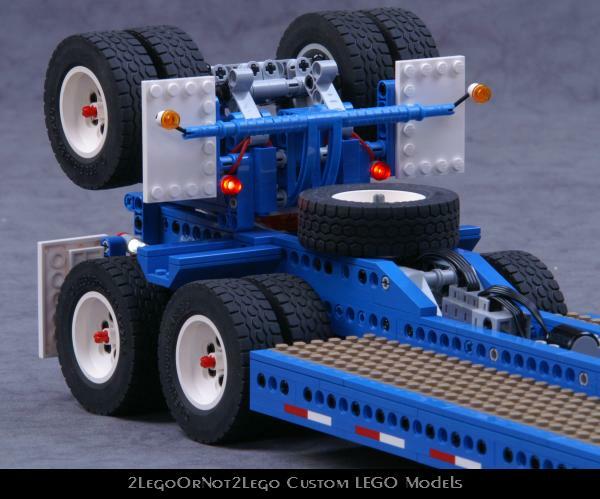 In this case a LEGO model of an US style 3 axle detachable gooseneck lowboy trailer which main feature is a Flip Axle, like Globe Trailers builds them. This is a in the scale of 1:17,5 and its features are: solid axle suspension, the third axle is a remotely controlled flip axle, truck chassis support on gooseneck, gooseneck locking mechanism, raisable deck and loads of LEGO Power Functions. You may find additional photos from this model at Ingmar's Brickshelf folder and see some similar real models in action, at these videos from Globe Trailers and Landoll.